Suggestions, Comments & Questions about the Forum Give us your feedback and tell us what you'd like to see or report a functionality problem. 2. Then on the left side of your screen click "edit options"
3. Scroll down to the place where it has subscriptions and set it to "instant email notifications" If you want email notifications and it will also list them in your "user cp" ..If you want them just to show up in your "user cp" set it to "no email notifications"
4. scroll to bottom and click "save changes"
Yes! First one to reply. I selected no email notifications, yet I am still receiving the emails.... help? If you already got some email coming before you seleected them.. You are going to have to open the emails and manually unsubscribe from each email. I was just trying to figure out how to turn off the email notifications. I set mine to no emails but was still receiving them from the previous threads I was subscribed to. You don't have to manually unsubscribe through each email. 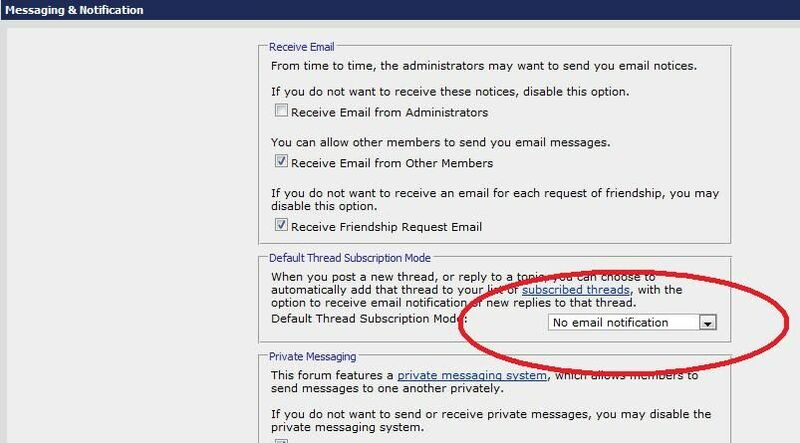 Click on User CP, then click on View all Subscribed Threads to the bottom right of the threads shown, select the check box next to the threads on the right, click the move to folder... drop down menu, select the subscription notification type you want, and click go. Is there anyway to get notifications (via forum pop-up or email) only when someone quotes one of your posts??? Quick Reply: How to get Notifications. All times are GMT -4. The time now is 04:05 PM.